Jimoh Moshood, Abuja: The Inspector General of Police, IGP Ibrahim K. Idris NPM, mni, on the 17th February, 2018 paid an operational visit to Zurmi in Zamfara State where Scores of innocent people were killed by suspected bandits on the 14th February, 2018. The IGP accompanied by the AIG Zone 10, Sokoto and Commissioners of Police in the zone visited Zurmi Local Government Area and held a Stakeholders meeting which had in attendance Traditional Rulers, Political Office Holders, Local Government Chairman, Hunters, Farmers, Village Vigilante Groups, the Fulani and Hausa Communities and other Critical Stakeholders, also present were the Police Community Relations Community (PCRC), Eminent Persons Forum, Politicians and Religious Leaders. The IGP deeply commiserates with the Government and People of Zamfara State over the heinous act that led to the killing of harmless and innocent people and calls for cooperation of all the people in the affected areas in supporting the Police to find a lasting solution to the killings and the arrest of the perpetrators. To forestall further loss of lives and ensure that the perpetrators of the killings are promptly arrested and brought to justice, the IGP has directed the deployment of additional three (3) units of Police Mobile Force (PMF) to the affected areas, bringing to ten (10) Police Mobile Force Units dispatched to the State in the recent time to augment the personnel of the Zamfara State Police Command to maintain law and order and sustain the normalcy that has been restored in Zurmi and other parts of the State. Meanwhile, on the directives of the Inspector General of Police, the Joint Special Investigation Team headed by Assistant Inspector General of Police Intelligence of the Force have proceeded to Zamfara State to commence immediately a detailed investigation into the killings, he will be assisted by the personnel of the Force Criminal Intelligence and Investigation Department (FCIID), the Intelligence Response Team (IRT), Special Tactical Squad (STS), Counter Terrorism Unit (CTU), Scene of Crime experts and the Zamfara State Command Criminal Intelligence and Investigation Department who are already on ground in Zurmi, Zamfara State. The Joint Police Investigation Team are under a definite and strict mandate to arrest and bring to justice the perpetrators of the killings, investigate the incident in totality with a view to unravelling the remote and direct causes of the unfortunate killings and prevent occurrence of such in the future. 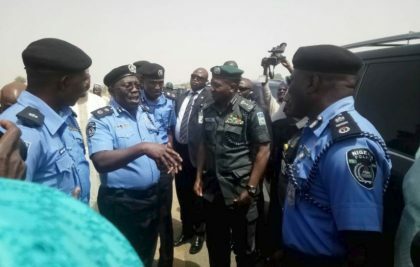 The Commissioners of Police and their Supervising Assistant Inspectors General of Police and their personnel in the contiguous states to Zamfara State have been placed on red-alert by the Inspector General of Police; they have also been directed to cooperate with the investigation team from the Force Headquarters. They are also to without delay convey stakeholders meetings in their respective States to address previous and current conflicts and clashes between Farmers, Herders, Hunters, Local Vigilantes and other interest groups in their States. They are further directed by the IGP to arrest and disarm all suspected bandits, militias and criminal groups in possession of prohibited firearms and restricted weapons in the region. The Force wishes to emphasize that the situation in Zamfara is not getting out of hands as reported by a Section of the Media, Normalcy has been restored in the affected areas and the situation is under control. The Nigeria Police Force hereby assures the People of Zamfara State and other States in the country of adequate protection of their lives and property, the Force therefore encourage them to go about their lawful activities without fear or apprehension but support and cooperate with the Police personnel deployed in their localities.